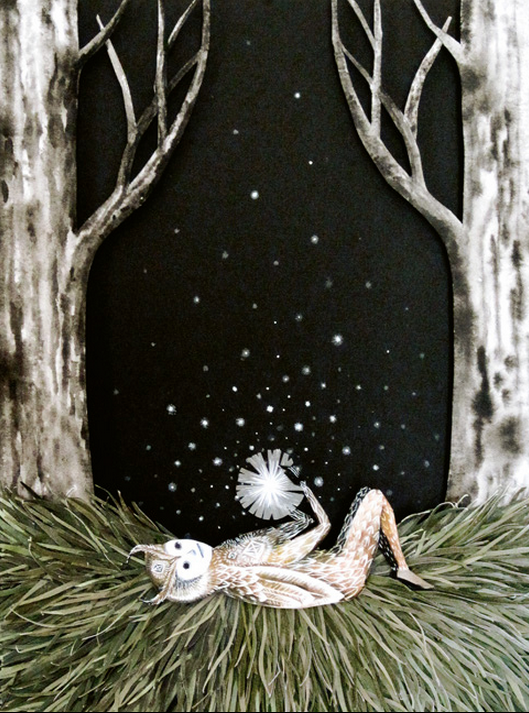 The night, darkness and nocturnal creatures figure prominently in the rustic yet mysterious art of Kentucky-born artist Kathleen Lolley. 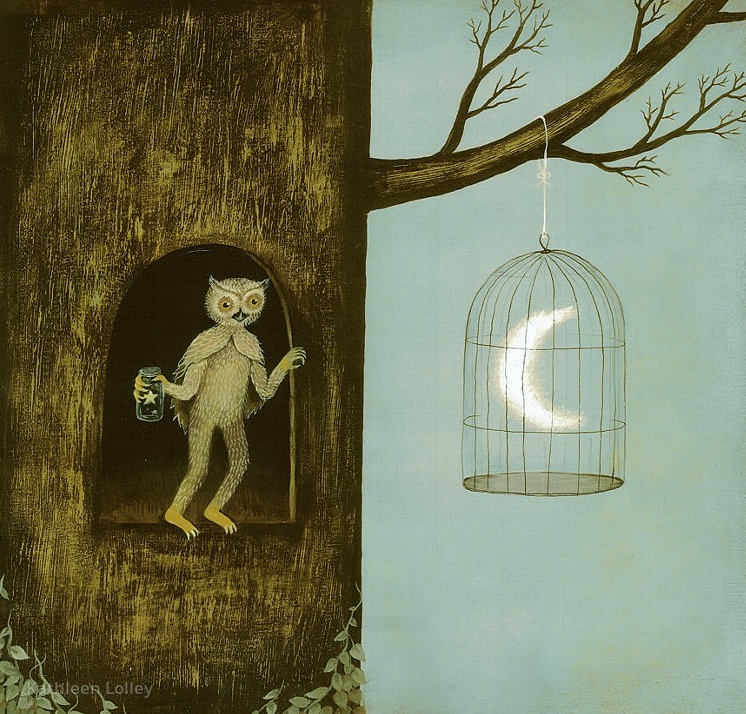 Owls, fireflies, and even little ghosts frolic in the softly-colored forests and woods of Lolley’s imagination. Like many of the artist I’ve featured in these posts, her art celebrates the sinuous, peaceful connection of nature and humans. Spending a childhood “split between the green hills of Kentucky and the magical dark forests of Pennsylvania,” as well as a long-held family tradition of sharing oral stories and folk tales, helped form a visual narrative that serves as the backbone of her intriguing work. These influences could also explain the many fantastical creatures that populate her dreamy greenspaces. “My visual style is an organic mix of surrealism and folk art. I use a wide variety of mediums including acrylic, oil, paper-mache, gouache, mixed -media and collage. I strive to allow enough ambiguity for the viewer to draw upon their own imagination to create their own interpretation. “I am very interested in exploring the unconscious influence of childhood in our adult lives. When I paint, I use innocence and playfulness to explore complex themes. I derive visual inspiration from nature, folk tales, philosophy & music and seek to synthesize these elements in my work. Enough said! You can enter her magical worlds by checking out the gallery after the jump. Again, this is but a small representation of her excellent work, and you guys can check out even more on her website (in which she shares more detailed information on each piece) or her Flickr page. This entry was posted in Art and tagged Art, Artist, Kathleen Lolley, Surrealism. Bookmark the permalink. Very interesting. I think I would like to see her originals. If she uses mixed media I think a lot is lost in printing them. Hi Victoria … sorry about my really tardy reply with this one … but your quote really nailed what I love about this work. I’ve always been fascinated with deep, dark, mysterious woods where the strangest and most magical things can happen, and her work captures a big part of my imagination. Really nice. Creepy and cute at the same time. Love it! Hi Etta … it’s that push and pull between the bucolic and the scary that I love most about her very intriguing work … a lot of them play out as dreams. glad you liked it.